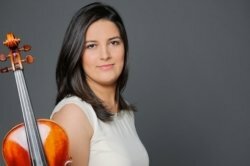 Portuguese Violinist, holds a Master and a Bachelor Degree in Performance with Honours from the Royal Academy of Music in London. There, she was a student of Igor Petrushevski, one of the leading violin teachers in the UK. She was also a student at the University of Arts in Bern with the international star soloist Benjamin Schmid, and was also part of the elite group of students at the International Menhuin Music Academy in Switzerland (2007-09). Born into a musical family, started to learn the violin at the age of 6. Heloísa has performed as soloist and chamber musician in Portugal (Casa da Música in Porto, Gulbenkian Foundation etc), England, Holland, Switzerland (Zentrum Paul Klee, Geneva Concert Victoria Hall, etc), Monaco (Auditorium Rainier III), Germany (Darmstadt Musikfestival), Italy, USA (Aspen Music Festival) Spain (Auditorio Nacional Música Madrid etc), Austria (Mirabel Palace and Mozarteum in Salzburg, and Konzerthaus, Vienna) and Brazil (Sala São Paulo, Campos de Jordão etc). More recently perfomed in Tel-Aviv, Israel (Felicia Blumenthal Centre). Currently leads the APE Ensemble, based in London. In 2014 was a violinist at the Southbank Sinfonia Orchestra in London having performed at major venues such as the Royal Festival Hall, Royal Opera House, Cadogan Hall, Saint Martin-in-the-Fields, St John's Smith Square and at the Notre-Dame Cathedral in Paris. She has worked extensively as first violin with Porto Symphony Orchestra Casa da Música, one of the top orchestras in Portugal (2007-2013). At the age of 17 was Assistant Concertmaster of the Aspen Concert Orchestra in Colorado, USA. Was a winner in several competitions in Portugal, such as 1st Prize at the Julio Cardona International String Competition, 1st prize at the Juventude Musical Portuguesa and 2nd Prize at the RDP Prémio Jovens Músicos. At the early age of 12, Heloísa represented Portugal and was a laureate at the Piccoli Mozart event in Montecarlo, broadcasted internationally on television. She was awarded a Santander Universities Award (2013) and holded a scholarship from the Calouste Gulbenkian Foundation during her studies in England. Heloísa plays on a Paul Kaul violin from 1928, named "Iphigénie". With nearly ten years of teaching experience both in music conservatoires and privately. Has already taught a wide range of both children and adults, even though works more often with children of all ages, starting at 4! She was a violin professor at the Lycée International de Londres Winston Churchill amongst other schools. Currently works at schools in the borough of Camden and has a selection of private pupils in London. She is also developing a class of pupils in Saltaire / Leeds / Shipley and Bradford areas. She is very familiar with ABRSM Exams and often her students achieve Distinction in exams. I believe that music is for everyone, whether working towards a career or not. As a teacher, I see myself as being friendly, dedicated, persistent and always expect the best results from my students. I tailor my lessons to each one of them, taking into account their personality, abilities and own goals. I want them to feel inspired, motivated and benefit from the lessons as much as possible. HeloísaFrom Richard (5/5): Heloisa is excellent. Nice and kind and a brilliant teacher.